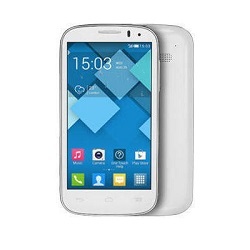 Die Entsperrung Alcatel OneTouch POP C5 mit einem Code ist sehr einfach. Das ist auch eine einzige und sichere invasionsfreie Methode um SIMLOCK zu entfernen. 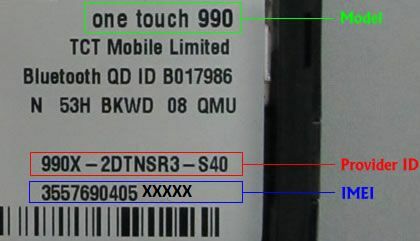 Der Code zur Entsperrung eines Alcatel OneTouch POP C5 Telefons kann man nur aufgrund der IMEI-Nummer erhalten. Diese erscheint nach Tastatureingabe von *#06# oder nach dem Herausnehmen des Akkus. Die IMEI-Nummer befindet sich auf einem Informations-Klebezettel, wie auf diesem Bild zu sehen ist. It took really longt time but after all the phone was successfully unlocked. codes were sent very quickly... thank you..
Good service. My phone has 2 sim slots, so I assumed to use both slots I needed 2 unlock with 2 codes. Before using the second code I put in a data sim in one slot and a voice sim in the other slot. They both worked with only one unlock code.....my fault in not trying it before ordering. Anyway the cost is great so good it does not matter. So great unlock code and fast service. No issues with payment. Excelente servicio, Funcionó perfectamente, ahora mi móvil esta liberado. Gracias. 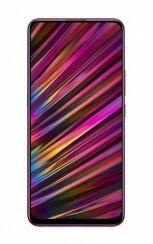 Wie kann man Code in das Alcatel OneTouch POP C5 Telefon eingeben? Excellent customer service and on time delivery. Very very pleased. They are the best. Su servicio es excelente no me quejo. Your unlock code was successful no problem. Muy buen servicio y rapido con pasos cencillos y faciles. sigan asi estan muy bien. Excellent service. They have changed my opinion about the websites that unlock phones. I was skeptical but the code worked. So Thank you all very much. ps. I wanted the code to run a T-Mobile USA sim card, and it did. Excelente todo. Rapidez y confiabilidad. Recomendable, la liberación fue un éxito. Code worked like a charm, I also received my code within the stipulated waiting time and I am very pleased with the quality of service. ESTA ES MI SEGUNDA COMPRA. SÍ FUNCIONÓ. SOLO UN DETALLE: PRIMERO ME MANDARON UN CÓDIGO QUE NO FUNCIONÓ PERO LES ENVIÉ CORREO AVISANDO QUE NO SE PUDO DESBLOQUEAR Y AL DÍA SIGUIENTE ( DIFERENCIA DE HORARIO ) RECIBÍ LA CORRECCIÓN Y SÍ FUNCIONÓ. NUEVAMENTE: SÍ LO RECOMIENDO. SECOND TIME I PURCHASE A CODE, THIS TIME FOR ALCATEL ONE TOUCH 5036A. AT FIRST I RECEIVED A CODE THAT DID'NT WORK BUT I SENT AN EMAIL REPORTING THE PROBLEM AND I RECEIVED THE CORRECT CODE THAT WORKED FINE. ALTHOUGH THIS LITTLE PROBLEM I HIGHLY RECOMMEND IT. THE LITTLE PROBLEM I HAD WITH THE FIRST CODE PROVED THAT THEY HAVE A VERY GOOD AND FAST CUSTOMER SERVICE.